Posted on 6.2.2012 at 1.43. Well. Once I started wrapping the wire, it seems that I just went on and on and on… And here we have the True Romance earrings. Light as a feather but 8cm long stunners, forgive me for saying it but I just love these. It’s good to love your work isn’t it? 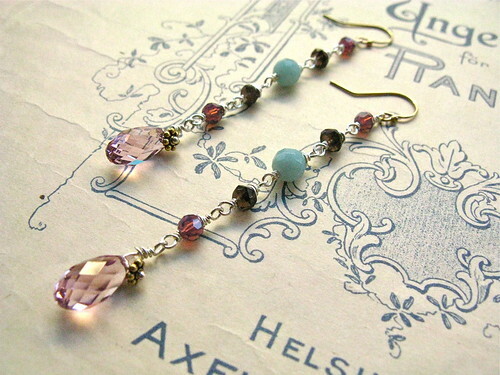 True Romance earrings featuring Swarovski crystals, smoky quartz and amazonite alongside hints of silver and gold. And since there’s obviously no stopping me with the length of earrings, let me introduce Flapper. A very simple style with Chinese carved horn beads hanging from some interesting black & gold metal chain (vintage/second-hand). 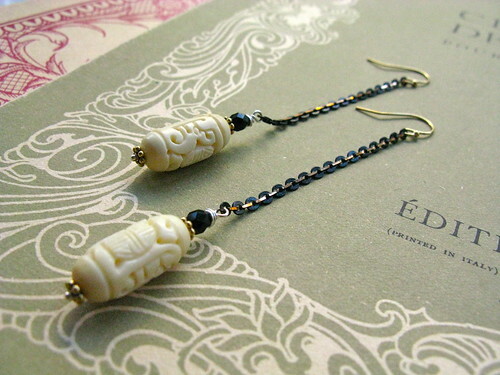 The full length of the earrings is a whopping 9cm but they are also comfortably lightweight. Artistic, I’d say. I love these. I love those too! Ja koska en osaa valita, niin voitko lahettaa tiedot kummankin hinnasta edellyttaen tietenkin etta ovat viela kaupan. 🙂 Niin ja lahetathan paketteja myos Kaliforniaan?..